Ian Mills is a highly experienced implantologist who has been involved with dental implants since 1999. During that period he has placed over two thousand implants and carries out all aspects of implant treatment, including advanced procedures such as bone grafting and sinus surgery. All his work has been audited since 1999 and during that time his success rate for dental implant survival is over 98%. 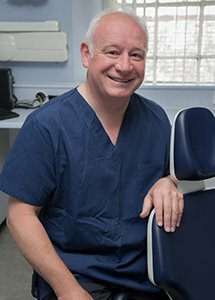 Ian has undertaken extensive postgraduate training in implant dentistry and in 2008 was awarded the prestigious Diploma in Implant Dentistry and a higher certificate in Advanced Implant Surgery from Royal College of Surgeons of England. He is one of only a handful of implantologists to hold this prestigious qualification. Ian has also been awarded the Fellowship of the Faculty of General Dental Practice (FGDP) from the Royal College of Surgeons of England, and a Fellowship of the Dental Faculty of the Royal College of Physicians and Surgeons of Glasgow. He is an examiner at the Royal College of Surgeons of England for the FFDGP (UK) and is currently the Vice Dean of the Faculty of General Dental Practice. Ian is also actively involved in research within primary care and has recently completed a doctoral thesis in Health Services Research at the Peninsula College of Medicine and Dentistry. Ian teaches and lectures regularly on the subject of implantology, and is a mentor for the Straumann Implant Company. He is a member of the International Team of Implantologists and is an Honorary Lecturer at Peninsula Dental School in Plymouth. Ian is also a member of the Association of Dental Implantology and was recently awarded a Fellowship from the Higher Education Academy in recognition of his contribution to education in dentistry.